Moss does not develop in healthy lawns. Lack of fertility, soil compaction, poor drainage, too much shade and poor soil aeration are the most common causes of moss in lawns. 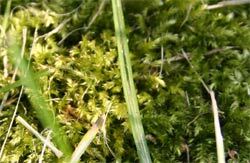 Moss is not directly harmful to grass, but moves into bare spots in the lawn as the grass thins out. Planting a more shade-tolerant grass (keeping in mind that an area receiving less than four hours of full sunlight per day is too shady for grasses). Mowing grass in shady areas at the tallest recommended mowing height to encourage deeper rooting and provide maximum leaf surface to the limited sunlight. Planting a shade-tolerant groundcover rather than a grass. Covering the area with mulch (pine straw, bark, etc.). Pruning some limbs, especially lower ones, from shrubs and trees. Removing some of the trees and shrubs. Enjoying the moss as a low-maintenance groundcover that requires little, if any, watering, no fertilizer or mowing, and stays green all year so long as it does not receive much traffic. Lime has often been suggested for moss control. Lime will raise the soil pH but will do little or nothing to prevent moss growth. The fact that the soil is acidic has little to do with the growth of moss. In fact, we see moss growing on limestone and concrete. If your lawn area is moist and shady, you will have difficulty controlling moss because you have an ideal environment for moss growth. 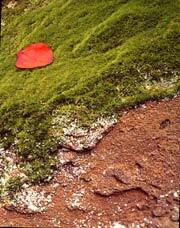 Moss is often troublesome in spring when temperature are cool and soil moisture high. Take a small box of baking soda and mix it with 2 gallons of lukewarm water. Dissolve thoroughly. Spray the water mixture of the moss and let dry. Best to do in late winter and early spring. This inexpensive treatment will not prevent the moss from returning. Once moss is removed either by hand or chemical spray, aerate, top dress areas with a fine mix of compost, top-soil, or peat moss. Reseed. If possible, remove some of the overhead tree limbs to let more light shine through. Mow the grass a its highest setting in this area. In shady areas, try to improve sunlight reaching the moss-prone areas. If not possible, plant shade tolerant grass suitable for your area. Aerate the lawn often and apply a light top-dressing. Aeration helps reduce soil compaction and improves the chances for new grass to develop properly. What do you do if you want to grow moss? Moss in the lawn is definitely something most people want to get rid of. But there are times when you would like to grow some moss and aren't willing to wait till some moss happens to take hold. How do you get moss to grow where you want it?